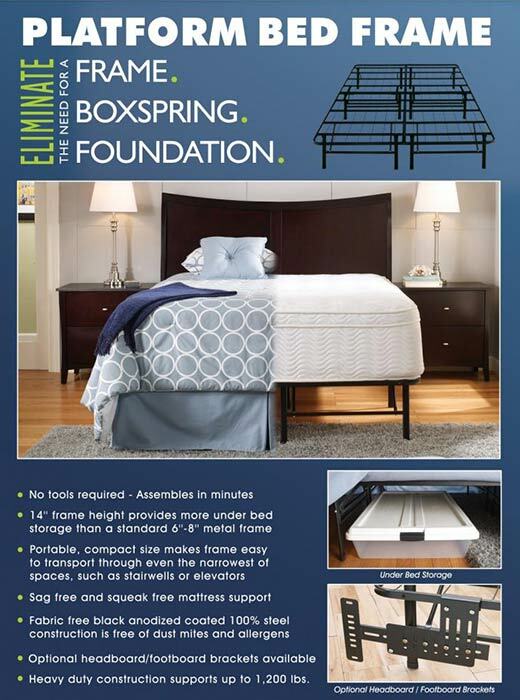 The Platform Bed Frame is an inexpensive alternative to the traditional box spring or foundation. Place your new mattress directly on this heavy duty frame and experience all night comfort and support. 14″ height provides ample room for underbed storage. Free shipping on this item to lower 48 States. 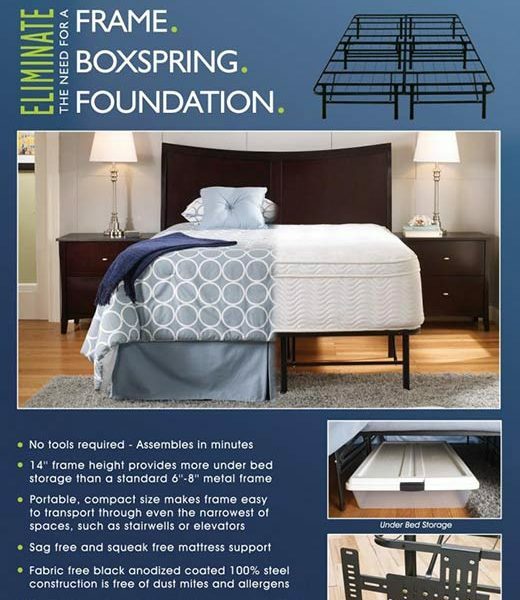 The Platform Bed Frame is an inexpensive alternative to the traditional box spring or foundation. Place your new mattress directly on this heavy duty frame and experience all night comfort and support. 14″ height provides ample room for underbed storage. This frame can stand alone or be used in place of the slats (inside the side rails) of your current bed. – Portable, compact size makes the frame easy to transport through even the narrowest of spaces, such as stairwells or elevators. – 14” frame height provides more under bed storage than a standard 6”-8” metal frame. – Heavy duty construction supports up to 1200 lbs. and provides sag and squeak free mattress support. – Easily assembles in minutes with no tools required. – Fabric free black anodized coated 100% steel construction helps keep you free of dust mites and allergens. – Optional headboard and footboard brackets available.